Myanmar is currently undergoing rapid transformation. The legal framework regulating employment in Myanmar is found in a variety of different Laws and Rules enacted over the last century. 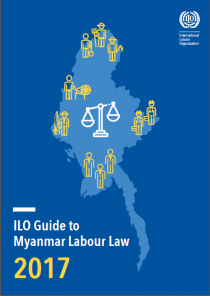 This Guide brings together many of the sources of Myanmar labour law in a single, user-friendly guide. The Guide also provides useful information on the International Core Labour Standards to promote and inspire good practice on employment and labour in Myanmar. 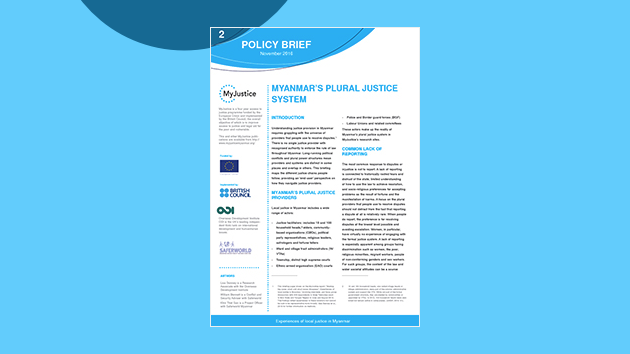 The multitude of justice challenges confronting people in Myanmar means that there is significant scope for, and interest in, rule of law and access to justice programmes among both foreign and domestic actors. While attention to justice concerns is welcome, there is a danger of taking for granted that there are shared and agreed understandings about the meaning of justice and its role in society. Understanding justice provision in Myanmar requires grappling with the universe of providers that people use to resolve disputes. There is no single justice provider with recognised authority to enforce the rule of law throughout Myanmar. Long-running political conflicts and plural power structures mean providers and systems are distinct in some places and overlap in others. This briefing maps the different justice chains people follow, providing an ‘end-user’ perspective on how they navigate justice providers. People in Myanmar face a wide range of justice problems, from land disputes to drug trafficking to violence against women. Yet in MyJustice research, debt disputes emerged as the most common dispute people spoke of, affecting large numbers of people in both Mon State and Yangon Region (Denney et al., 2016). Yet debt disputes have been largely overlooked to date. They highlight the importance and challenge of equitable access to credit in a transitioning country like Myanmar, without which there are both justice and developmental consequences. As with most justice problems, debt disputes and a lack of formal credit access affect the poor and vulnerable most acutely.